I've been "playing" with some Dell hardware recently and as with everything I like to try and automate as many tasks as possible. Dell have a really useful tool called Racadm which is a command line utility which you can call from a script to read and write various properties of Dell iDRAC and CMC (Chassis Management Controller). However, since the latest iDRAC and CMC are built around WSMAN and DMTF standards, I prefer a more PowerShell only approach. 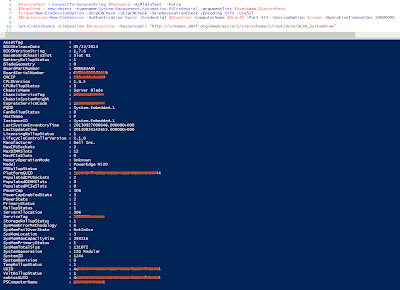 The key PowerShell command for querying is Get-CimInstance. Before we can use this command however we first need to establish a remote CIM Session to the hardware. This is accomplished by using the New-CimSession and New-CimSessionOption cmdlets. Once we have the session established, we can then use the Get-CimInstance cmdlets to query various properties by passing in a WSMAN/WinRM ResourceURI. Get-CimInstance -CimSession $Dracsession -ResourceUri "http://schemas.dmtf.org/wbem/wscim/1/cim-schema/2/root/dcim/DCIM_SystemView"
$NICS=Get-CimInstance -CimSession $Dracsession -ResourceUri "http://schemas.dmtf.org/wbem/wscim/1/cim-schema/2/root/dcim/DCIM_NICView"
Hmm... Useful for SCVMM Bare Metal deployment scripting maybe? The only thing that I struggled with this very simple method of querying the hardware for info, was the resource URI needed. 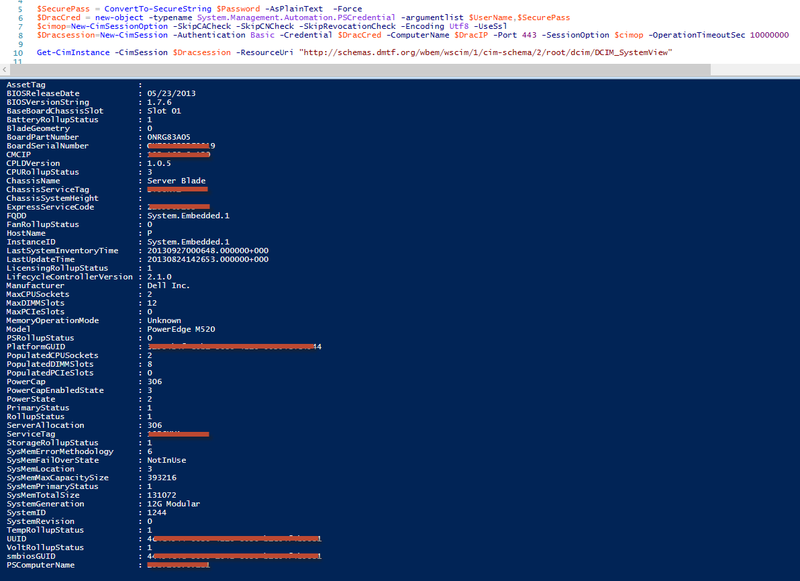 Next time I'll post about using PowerShell to set the values rather than just query them.